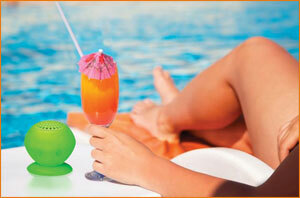 The AudioSource Sound pOp is a high quality, portable, water resistant Bluetooth speaker. This high definition mobile audio Bluetooth speaker can also act as a convenient hands-free device with one touch redial thanks to a built-in mic. The strong suction cup sticks to any smooth surface and is completely water resistant. Great for use in shower, hot tub, and rain, the Sound pOp adds great sound where you want it. The AudioSource Sound pOp is a high quality, portable, water resistant Bluetooth speaker and a high definition mobile audio, hands-free speaker phone that utilizes Bluetooth 4.0 technology. The Sound pOp is completely water resistant and has a strong suction cup that sticks to any smooth surface. Great for use in the shower or hot tub, by the pool, on the boat, anywhere. The Sound pOp adds great sound anywhere you want it and it allows you to make and take calls hands-free. The 1.5" high definition, high-efficiency speaker is powered by a 3-watt, full-range class "D" amplifier for satisfying sound from a tiny package that goes anywhere. Advanced DSP technology creates amazing sound quality in a smooth, compact devices that streams music or phone calls up to 32 feet. The Sound pOp not only plays your favorite tunes anywhere, but it also has a built-in mic so you can make and take calls from any Bluetooth-paired smartphone. The Bluetooth 4.0 technology has high-definition voice capability and noise cancellation so it delivers extremely clear sounding calls. Stick the Sound pOp to your car's winshield or anywhere and use it as a convenient device for chrystal clear, hands-free calls on the go. The soft, easy-to-clean, durable silicone rubber case features a TPR suction cup that allows you to stick this wireless Bluetooth speaker/hands-free speakerphone anywhere. Stick it to your desk, your window, your windshield, or take it with you to the patio, boat deck, picnic table, and more. The built-in rechargeable 500mAH Lithium-ion battery delivers up to 8 hours of play time on a single charge. Charge the battery using the included USB charging cable with any powered USB port. AudioSource Sound pOp Wireless Bluetooth Speaker/Hands-Free Speakerphone with Bluetooth 4.0, USB charging cable, and instruction manual.